Titan One review: Play Xbox One with Playstation controllers and much more. Titan One review by Paul Acevedo from WindowsCentral.com! We really appreciated your effort and time spent reviewing our product! “A couple of months ago, we reported on a unique accessory from ConsoleTuner that allows gamers to play any of the four big systems (Xbox One and 360, Playstation 3 and 4) with controllers designed for other systems. I could imagine numerous potential uses: enhanced comfort from using the controller you like best, the ability to use expensive accessories like arcade sticks and racing wheels you already own for older systems, and much more. At last I’ve picked up a Titan One and put it through its paces on my Xbox One and 360. With the diminutive USB adapter, I managed to play Halo: the Master Chief Collection with Xbox 360 and Playstation 3 controllers, Forza Horizon 2 with a Playstation 4 DualShock 4 controller, and even Killer Instinct with a USB Sega Saturn Pad for PC. Some of the Titan One functions have a bit of a learning curve, but our detailed review and hands-on video will show you how to get started with this must-have peripheral. Inside the Titan One box, you’ll find the Titan One itself, a brief instruction manual, and a very short mini-USB cable. The cable can be used to connect the Titan One to a PC in order to load it with controller profiles and scripts, update its firmware, and more. 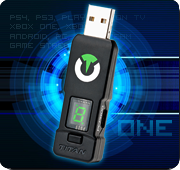 The Titan One is a black USB device measuring about 2.75 x .75 x .5 inches (70 x 19 x 11.5 mm). The top of the device bears its logo, a small LED panel, and a button. The LED displays one character at a time while the device is powered, though the character can alternate to represent two-character status messages. For example, when you first plug it in to your console, it will flash “A” and then “U” for “Authenticate”. In combination with the button, the LED can be used to switch control profiles. The profile starts on zero (no set profile) by default. Users can store up to nine customized profiles, which must be installed through the free Gtuner Pro software before use. Once you have some profiles set up, just press the button to switch to them on your console. You’ll find a full-size female USB port on one end of the Titan One. There you’ll plug in controllers for authentication or for use. The side of the Titan One also has a female mini-USB port for PC connectivity. We’ll describe console authentication and PC connectivity shortly. Next Gen Controller Mods Made Easy By Titan One! Titan One review by XPGameSaves.com! We really appreciate the effort and time you spent reviewing our product! “Do you miss all the controller mods that you could get on the old gen consoles on your Next gen Xbox One or PS4? Wouldn’t it be nice if you could have controller mods without actually having to open up or send away your controller? Well thanks to the guys over at ConsoleTuner you can do exactly that! You can have controller mods on a next gen console without actually having to open up or mod your controller. All the best controller mods right at your fingertips without actually voiding your warranty. Who doesn’t want mods like “Rapid Fire, Anti-Recoil, Auto-Spot, Quick Shot, Drop Shot, Secondary Rapid Fire, Jump Shot, Auto Reload, and Easy Sprint”? 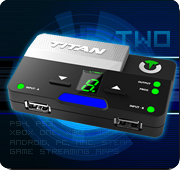 Titan One is the perfect solution for no nonsense mods on Next gen consoles. Another neat feature of this dongle is that it allows you to use virtually any controller on any video game console, for example you could use an Xbox 360 controller on a PS4, or an Xbox One controller on an Xbox 360. The Titan One even has support for keyboard and mouse for those who prefer that gaming style over console controllers.